Victoria Beckham's calendar is packed throughout the year, so she's well-versed when it comes to easy event dressing. 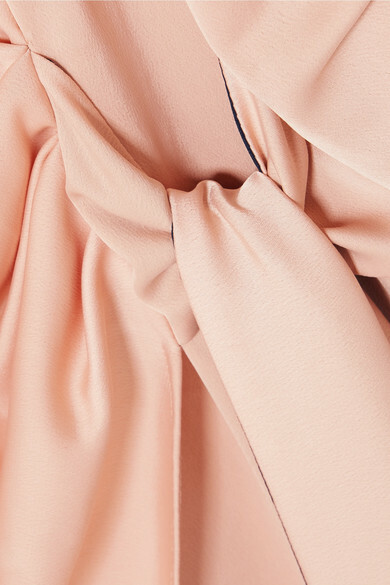 Made from lightweight glossy peach satin-crepe, this '80s-inspired mini dress is cut in a wrap-effect silhouette with gathers at the side to flatter your stomach. A peek of the midnight-blue lining can be found on the open neckline, matching the draped ties' backing. The cuffs are ruched to mimic the way the designer likes to push her own sleeves up. Shown here with: Gu_de Tote, Proenza Schouler Pumps, Paola Vilas Ring.